Anyone who knows me is well aware of the fact that I am an avid University of Kentucky basketball fan. I attended my first UK basketball game when I was nine months old. My father, Glenos Cox Jr. was a Civil Engineering student at UK. He, my mother Almara Siler Cox, and I lived in the Cooperstown Student Apartments. I feel certain I bled blue from my birth even though I was born in Knoxville, TN since my parents lived in Williamsburg, KY at the time. The University of Kentucky Wildcats have an unrivaled tradition of success, greater than any team in college basketball. Luther and I have attended the last four of the eight NCAA Championship games that UK has won. We were in St. Louis on March 27,1978 witnessing Jack “Goose” Givens score 41 points when our Wildcats defeated Duke in the final game 94-88. Luther, Jordan and I were in East Rutherford, NJ on April 1, 1996 when UK beat Syracuse 76-67 led by Tony Delk with 24 points for our 6th NCAA National Championship. This tournament was only four years after the deaths of Jordan’s brothers Drew and Jeremiah so a bittersweet victory for the three of us. Defending national champions Kentucky lost in the championship game in 1997 when Arizona beat our Cats in Indianapolis 84-79 in overtime. Luther, Jordan and I were in attendance that night but had heavy hearts since an employee’s father had passed during the Final Four. Basketball games take a back seat to grief over the loss of a friend. 1998 was another banner year for UK basketball. UK beat Utah on March 30, 1998 by a final score of 78-69. 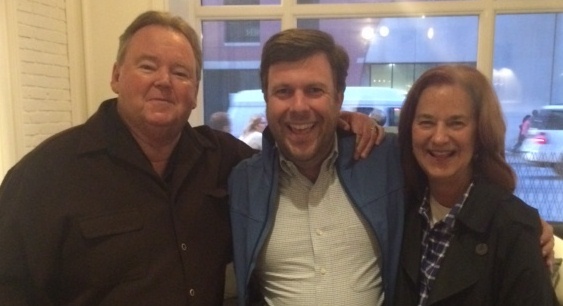 Luther and I were in San Antonio, TX with my brother Gary Cox and his wife Karen. UK had won its 7th NCAA Championship, second only to UCLA. Fourteen long years passed before UK won their 8th National Championship. The year was 2012 and our team was led by freshman Anthony Davis. The win was the first for Coach John Calipari. This was a special team. The final game was held in New Orleans and to no ones surprise, Luther and I were there cheering on our Cats. Anthony Davis (#23 ) was the MVP in our 67-59 win over Kansas. I distinctly remember leaving the stadium that night after the win and looking up at the Superdome with the University of Kentucky National Champions logo shinning through the rainy mist. Both Luther and I reminisced about how much Jeremiah loved New Orleans. He had made many trips there with his best friend John Caffrey and his family. I know both Drew and Jeremiah were at that game, maybe even sitting on the bench. They loved UK basketball as much as I did. Those of you reading this entry may wonder where in the world is she going with this litany about UK basketball. Well, all this leads up to this 2014-2015 season, a one for the history books. Our team was preseason #1 and held that same #1 ranking the entire year. We finished the season undeafeated at 31-0, best start in school history. We won the SEC tournament in Nashville and then headed to the NCAA tournament still undefeated. Luther and I made traveled to the Yum Center in Louisville to watch the Cats win their first two games of the tournament. We then drove to Cleveland to watch the Cats play in Quicken Arena. Two more victories and now the Cats were 38-0 and headed back to Indianapolis and the Final Four. Everyone in BBN felt the pressure of the undefeated season but knew they had already witnessed maybe one of the best teams ever to play the college game. It is now Friday night before the semi-final game in Indianapolis. Luther and I have driven up to Indianapolis a day early and had plans to meet my brother Gary, sister-in-law Karen along with Gam and Becky Greer for dinner at St. Elmo’s. The streets were packed with fans from Kentucky, Wisconsin, Duke and Michigan State. There is nothing more exciting than the Final Four if you are a college basketball fan. Even better if your team is one of the participants. St. Elmo’s is located next door to the Le Meridien Hotel on S. Illinois Street in Indianapolis. Luther and I know the hotel well. It used to be The Canterbury Hotel. This hotel has played an important role in the history of our family. Drew and Jeremiah spent the last night of their lives at The Canterbury Hotel back on July 22, 1992 when they were in town for the Guns N’ Roses, Metallica and Faith No More concert. Luther and I had only been able to make one other trip to The Canterbury in the twenty-two years since that last night for Drew and Jeremiah. Now, here we were right next door. Luther suggested to the group that after dinner we go into the Le Meridien (The Canterbury) in honor of the boys. Since Gary and Karen had to drive back home that night to their home in Columbus, they decided not to join us. The Greers were staying in town like we were so they said they would love to go with us for support. Now, Gam and Becky Greer are very special friends of ours. Many of you reading this know that they too are bereaved parents. They knew it was important for us to go into The Canterbury and felt we needed support. Little did they know what part they were to play in what unfolded. Even though it was crowded, we immediately found a table and the four of us sat down. As girls normally do, Becky and I decided to check out the bathroom. As we were leaving the room, I noticed that Gam had approached a group of two men and a woman who were sitting at the next table. I distinctly heard “Mt. Sterling” as we got up to go to the bathroom. Mt. Sterling is a town in Kentucky so I assumed the person Gam was talking to was a KY fan. Gam Greer is one of most outgoing people I know. He talks to everyone and everyone loves him. He had gone over to the three people at the next table and found out that one of the men was from Mt. Sterling. Gam had asked if they were in town for the game the following day. They said they didn’t have tickets but just wanted to be a part of the excitment in Indianapolis surrounding the Final Four. One of the men was a UK fan, the one from Mt. Sterling. Gam left the group as they got up to leave and went back to the table where Luther was sitting. 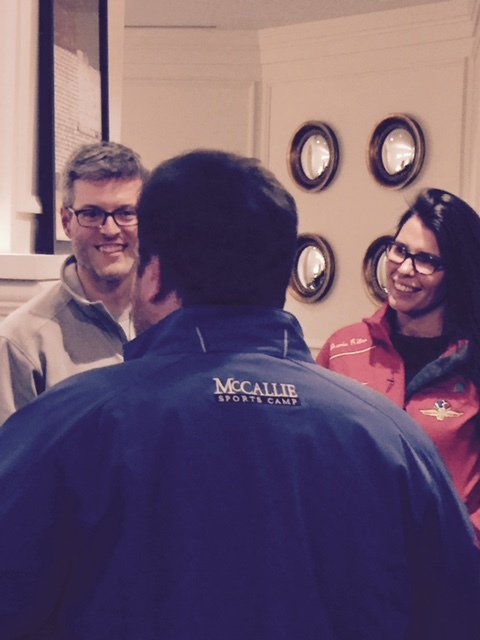 All of a sudden Gam noticed that the young man from KY had McCallie on the back of the jacket he had just donned. Gam said he said, “Hey, my friend here had sons that went to McCallie.” The young man came over and asked Luther the names of his sons. When he said, Drew, Jeremiah and Jordan Smith, the young man said, “I am Hank Blamblet.” Hank Bramblet was going to be Jeremiah’s sophomore roommate at McCallie. Luther could not believe who was standing in front of him. Luther asked Hank if he knew the significance of this hotel. Hank said he knew this is where Jeremiah and Drew had spent their last night. He also said that was why he and his friends had come to this hotel. He introduced Luther and Gam to the couple with him. The young man had been Hank’s college roommate at Wake Forest. When Hank hugged me it was like a hug from Jeremiah!! Tears flowed and flowed! Honestly I could not stop crying. How in the world could all of us be in the exact same hotel at the exact same time? What are the chances? When we called Jordan at home in SC that night with the story, he said it was maybe one in a billion. I agree. All of us saw the hand of God that night. It is an experince I will never forget. Saturday dawned and we headed to the National Semi Final games. At any other point in time, I would have been a nervous wreck worrying about the outcome of the game. Our team was 38-0 and on track for an historic season if we could win just two more games. All seemed irrelevant after the experience from the previous night. My Cats lost that Saturday to Wiscinsin. Gone were the hopes of the first undeafeted season since the Indiana Hoosiers in 1976. I was disappointed sure but left the arena knowing that Luther and I were meant to be in Indianapolis that weekend for a different purpose. We were at The Canterbury Hotel that Friday night to share Jeremiah and of course Drew with Hank Bramblet, his friends and especially with our dear friends Gam and Becky Greer. There will be another basketball season. There may never be another experience like this that so plainly let me see how in tune we all are to our special angels.